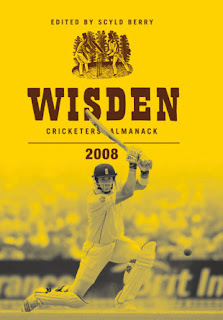 The Wisden Cricketers' Almanack 2008 has been published. It is a nice touch. The features throughout are extremely well written. The detail, of course, is unsurpassed. The attention to accuracy by Berry and his "disciples" as he calls his assistant editors in an allusion to the book's supposed Biblical command, is impressive. Where else but in Wisden would be printed this errata: "Oxford UCCE's 2007 captain, PJW Young, attended Wellington College." He had had the misfortune to be listed as having gone to the less prestigious Wellington School, which, as followers of Jeffrey Archer's career will know, can be easily muddled up. The conundrum that Berry, and indeed all newspaper editors and columnists face is: how to tackle the IPL, the ICL, and the seemingly inexorable growth of Twenty20? Not only is Berry's market one that, on the whole, will not take willingly to this form of the game, he himself will be challenged by its brashness: what Glamorgan's equally erudite scorer, Dr Andrew Hignell, calls "an indictment of our society". One or two cricket writers may enjoy watching Twenty20, but few relish reporting it. What is there to be said about a match-winning 13 not out? Berry, rather like the old leader writer in the Times, when it came to assessing the crucifixion, tries hard to be fair. "I am not against Twenty20," he writes, and he makes the pertinent comment that "the joyless and long-winded" 50-over World Cup last year played into the hands of the IPL and ICL organisers, but there is a sting at the end of his editor's notes: "In the course of time, what 20-over cricket lacks - if only a change of tempo - will become ever more apparent, by comparison with Test cricket." So to the content of the other articles. Mike Brearley, who in his speech at the dinner to launch Wisden was as fair-minded towards developments in India as he was towards Kerry Packer's World Series Cricket 30 years ago, writes illuminatingly about Bedi's deception in his bowling. Paul Newman of the Daily Mail contributes a long and highly detailed account of the mystery surrounding the death of Bob Woolmer, concluding that for the jury to return an open verdict after a long inquest was "the worst possible verdict - because it means we just do not know whether he had his life taken from him or simply succumbed naturally to the stresses inherent in his very demanding job". Strangely enough, the inquest itself last autumn received little media attention by comparison with the deluge of comment when Woolmer died. Pat Collins, in his review of the year's books, has no time at all for Duncan Fletcher's autobiography - or, perhaps more to the point, Fletcher himself. "The Wisden Forty," an account of the leading 40 players in the world during 2007, is an article too many. latest from kuselan!!! kamal in kuselan??? sourav's best test knock..in kanpur!! How to gain weight ?? Comet holmes losing its tail....!!! Will ishant return for the third test? ?